If I see another film this year I enjoy and am moved by as much as Wes Anderson’s The Grand Budapest Hotel, I will, quite frankly, be stunned. It is always a joy to experience a new film by a director one regards highly among their personal favorites, but when a beloved filmmaker delivers something truly, astonishingly transcendent, even when judged only in relation to that filmmaker’s own canon, that is a special occasion indeed, and it is exactly what Anderson has delivered here. To say the man is working at the pinnacle of his aesthetic prowess would be a tremendous understatement. Cinema has never looked or sounded more breathtaking, immersive, or imaginative as this, and rarely has it been assembled and delivered with such energy and precision. Anderson seems less of a filmmaker here than a magician, and those who allow themselves to be cast under his spell are in for one of the most exuberantly plotted, tightly paced, and emotionally engaging cinematic experiences in years. From areas technical, narrative, intellectual, thematic, and character-based, The Grand Budapest Hotel has all I could ever want out of cinema, and a little bit more just for good measure. Calling it a triumph only scratches the surface. The film is set (for the most part) in 1932 in the fictional Republic of Zubrowka, a nation in its cultural heyday facing imminent ruin, and thus a stand-in for any number of European nations recovering from one World War while the second approaches. Anderson, perhaps the greatest living optimist of the cinema, places his beautifully madcap comedy here, on the eve of the twentieth century’s darkest hour, to make a point it feels his entire career has been building towards, about the power of kindness, the nature of storytelling, and the point at which the two intersect. The film is framed by several layers of chronological remove – starting in the present and flashing back three times before we arrive at the central action of 1932 – and by the time the story really gets underway, it is clear Anderson wishes to explore not only the ways in which we pass down stories, but the nature of the ones we choose to bequeath. What is their power, why do they endure, and why do they continue to matter to us, long after those who lived out the narrative are gone? 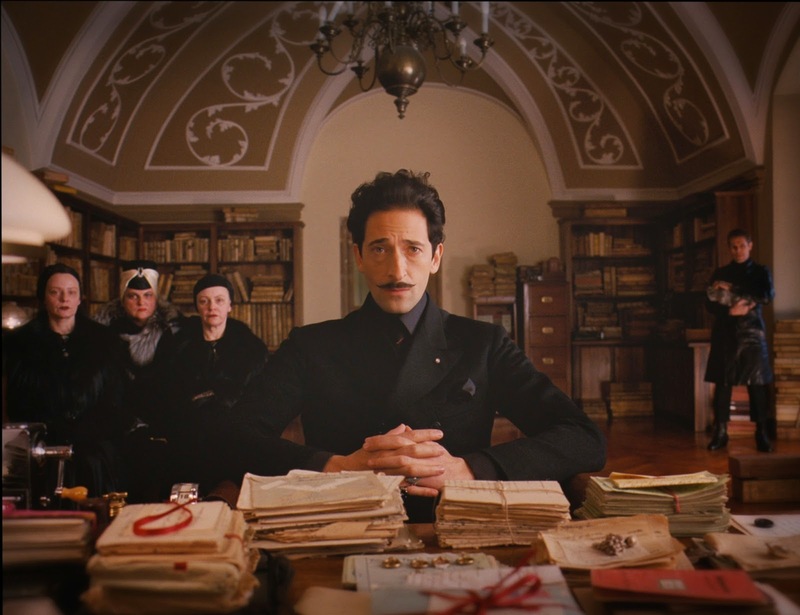 In the case of The Grand Budapest Hotel, the central story being passed down is not one of great historical incident, and that is exactly the point. Set between two World Wars, with political conflict igniting around the fringes, this is the tale of an immigrant lobby boy, Zero Moustafa (newcomer Tony Revolori), and the wondrously larger-than-life concierge of the eponymous hotel who takes him in, Gustave H. (Ralph Fiennes). Gustave is kindness personified, a man not without temper or failings, but who treats all those he meets with caring, compassion, and an open mind. It is a rather stunning testament to Anderson’s lively writing and Ralph Fiennes’ absolutely committed, wholly lived-in performance that Gustave comes across as a real flesh-and-blood human being – a character who could conceivably exist not only in this world, but at the center of it for the people he touches – rather than a walking metaphor. It takes no great feat of critical insight to see that Gustave, in his seemingly infinite goodness, represents that which the world most desperately needed as the twentieth century descended further and further into fascism, hatred, and warmongering, but for Anderson’s story to work, we have to believe in and love him as a person, not merely an idea. That we do, and as a result, The Grand Budapest Hotel soars. Gustave is quite possibly Anderson’s greatest character creation, and represents the finest work of Fiennes’ immensely distinguished career. In any case, Gustave is, early in the story, framed for the murder of an old woman he loved dearly, and from this misplaced accusation flows an increasingly, delightfully complex tale of intrigue, adventure, and friendship. It is an utter joy of a yarn, warmly told and richly realized, but the progression of the story matters much less than what it says about the characters, their relationships, and the times in which they live. The unlikely friendship shared by Gustave and Zero is the real meat of the film, and watching it grow, develop, and gradually touch others in their orbit is a positively inspiring pleasure. This is a story touched by darkness, with violence, prejudice, and social discord lurking delicately around the edges of every scene, but it is a beautifully, infectiously happy film, because the kindness that defines our two main characters determines the tone, and the unrestrained glee and vitality of the tone, in turn, overshadows any negative emotions. Which, of course, is exactly the point. Anderson’s belief in the innate potential for goodness at the heart of mankind has never been in question, from the confused youths struggling to discover how to express it in Bottle Rocket and Rushmore, to the dysfunctional families fighting to find and maintain true compassion and understanding in their relationships in The Royal Tenenbaums, The Darjeeling Limited, and Fantastic Mr. Fox, and here, he finally applies that belief to a broad, historical scale. Even as Anderson relates it all through an elaborate and stylistic fiction, the conclusions he draws are undeniable. In the ways we treat others and the value we place on the lives we lead, we determine the tones of our own lives, right up until the minute life is snatched from us. And even if they exist in a period of worldwide hostility and disunity, a person who creates an atmosphere of love and inclusion will not be forgotten, for kindness still has a place – especially so, perhaps – when human society is at its worst. Gustave’s compassion touches Zero, who carries Gustave’s story through life and passes it onto others, and in this way, Gustave and his kindness mean as much as the broad historical horrors of the period. A small story of human decency like this one in no way erases the worst mankind is capable of, but it helps to balance the scales, for one Gustave H. is worth a multitude of wicked dictators. Both kinds of persons’ stories are passed down, but one makes us feel so much more fulfilled than the other, and it is that feeling which is worth experiencing, worth striving to create, and worth sharing with others – which is, of course, a fundamental purpose of storytelling. In this way, Anderson has crafted the ultimate thesis to his own career. He has also topped himself aesthetically once again, and by a fairly mind-bogglingly wide margin. 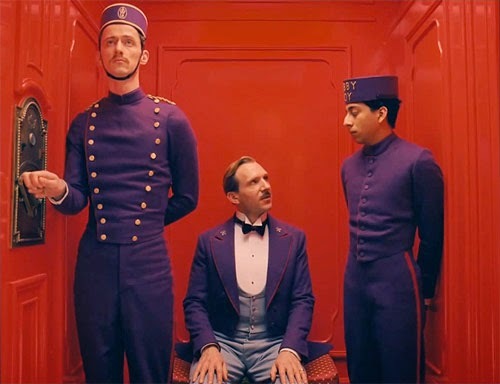 The Grand Budapest Hotel immediately shoots into the uppermost echelon of the most visually powerful or profound films I have ever seen – a space shared by Kieslowski’s The Double Life of Veronique, Ozu’s Tokyo Story, Kurosawa’s Throne of Blood, Kitano’s Hana-bi, Sokurov’s Mother and Son, and Malick’s The Tree of Life, to name some titles that immediately come to mind – with Adam Stockhausen’s production design, Milena Canonero’s costume design, and the great Robert Yeoman’s positively stunning cinematography combining to create some of the most remarkable modern movie images of our time. Like Anderson’s previous feature, Moonrise Kingdom, The Grand Budapest Hotel borrows heavily from the highly detailed, gorgeously handcrafted aesthetic of Anderson’s animated Fantastic Mr. Fox, and even manages to push that style quite a bit further. Every single frame is bursting with meticulously designed and arranged background detail, as if the characters exist inside the world’s most lavishly and compulsively decorated dollhouse, and Yeoman has captured it all with impeccable deep-focus work. In addition, the majority of the film is photographed in the 1.33:1 Academy standard aspect ratio, employed from cinema’s birth through at least the first half of the 20th century (and beyond for many filmmakers and, of course, television), and it is such a wondrously effective revitalization of the retired frame size that I wonder if (and sincerely hope that) more filmmakers shall be inspired to use it. As many of the greats who shot in this format taught us (Yasujiro Ozu comes immediately to mind), the height of the 4x3 frame can emphasize, develop, and contextualize interior space better than any other screen format, and Anderson uses that understanding to bring the titular hotel and many other equally fantastic sets to stirring, immersive life. What’s more, Anderson’s strikingly rich use of color and signature mix of tightly choreographed in-frame motion and horizontal Steadicam pans adapts perfectly to the format, making for the most technically accomplished photography of his career. The film is an absolutely overwhelming feast for the eyes, and I urge all who can who take in this experience on the biggest screen they can find. It is, simply put, a revelation. And as rigorously, expertly constructed as each individual element of the film may be, the finished product feels remarkably effortless. There is an incredible momentum and energy to the film that never lets up for even a minute, and considering how many beautiful character beats and emotional grace notes are contained therein, the nonstop forward thrust is doubly impressive. Anderson’s directorial playfulness is matched beat for beat by Alexandre Desplat’s joyous musical compositions – Desplat uses Anderson gigs as an excuse to cut loose and experiment, and God bless him for it – and a massive ensemble cast that is game for anything. Pretty much any actor you have ever seen and loved in a Wes Anderson movie appears at one point or another, along with many newcomers to the director’s ever-growing troupe, and all of them imbue their characters with depth, resonance, and pitch-perfect comic timing, no matter how big or small the part. Anderson is the rare director whose films I tend to love more or less equally, and while that does not necessarily change with The Grand Budapest Hotel – I could not begin to tell you where I rank this among all his other great features – it is undeniably invigorating to see a filmmaker, nearly twenty years into his already distinguished career, refuse to stop innovating. The Grand Budapest Hotel is both a distinct product of Anderson, and a little unlike anything he has ever done, bigger, more ambitious, and more broadly resonant, on levels emotional and intellectual, than any of his previous films. How many directors can claim to continue taking such monumental steps forward on their eighth feature, the point at which most have long since settled into a particular aesthetic or narrative style? Anderson’s voice has always been identifiable, but the more he develops and experiments with it, the more I realize what a treasure he is to cinema. The Grand Budapest Hotel is a stirring testament to that truth. The Grand Budapest Hotel is now playing in limited release, and will expand nationwide on Friday, March 21st.